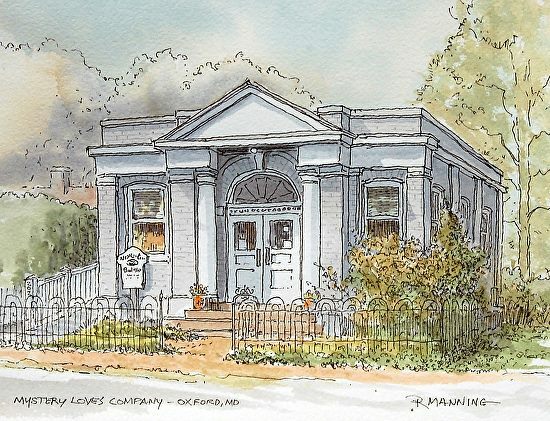 Welcome to Mystery Loves Company in Oxford, MD, your bookshop for Scribes of the Shore. Originally founded in Baltimore in 1991, Mystery Loves Company remains the only store specializing in new and gently used mysteries in the Baltimore-Washington area and from New Jersey to Florida. Since 2006 we have been located in the beautiful waterfront 360-year-old village of Oxford, MD. More information at www.portofoxford.com. We are a full-service bookstore located in the beautiful waterfront town of Oxford on Maryland’s Eastern Shore in Talbot County, Maryland. We offer books on the Eastern Shore’s history, flora and fauna, and fiction for all ages, as well as an in-depth collection of mysteries, both new and gently used in hardback and paperback. We provide friendly service to the well-read mystery reader, as well as those who are just getting started, with helpful recommendations for new authors. We welcome the well-read mystery reader, as well as those who are just getting started with helpful recommendations for new authors and titles. We are a general independent bookstore offering new and gently used books of all types for all ages including non-fiction on the Eastern Shore of Maryland, books by local authors and books to educate and make you smile. Frequently, we hosts author signings and sponsor special mystery events. Every month, we publish our email newsletter of events, recommendations and new mystery titles. We do mail order and special orders of any in-print title. We help you create mystery gift baskets with books, and related items, mugs and other goodies. We gladly accept want lists which we fill from our store stock and our additional 30,000 books in our “warehouses.” Just call 800-538-0042 or email us at mysterylovescompany@gmail.com and we’ll get the books to you. All credit cards, Visa, MasterCard, Discover and American Express are accepted. Read a lovely review of MLC in Fine Books & Collections. New article In Praise of Independent Bookstores features MLC. Read Sister-in-Crime's blog's posting about MLC.